2017 has been a whirlwind for me and Patti. 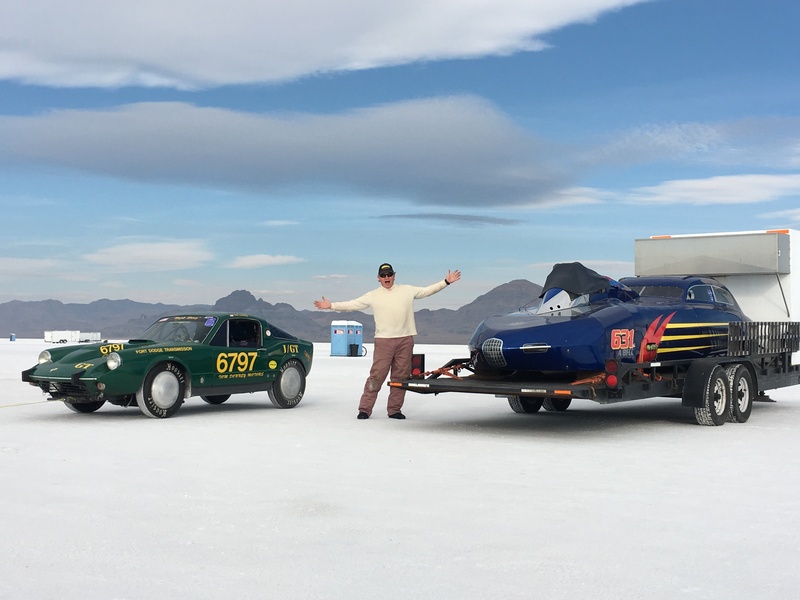 With me receiving an artificial disc in my low back and the June purchase of the “Saab Heritage Car Museum USA” in Sturgis South Dakota, land speed racing has taken a bit of a backseat. We were unable to make it to Speed Week sponsored by the Southern California Timing Association in mid August due to my primary engine have been ruined by a vendor attempting to put a special coating on the cylinders. (We run a long nose triple, carb block sleeved down to 66mm to be class legal). This coupled with the world renowned Sturgis motorcycle rally running the week before Speed Week I simply did not have enough time to get my “back up” engine ready. And since we hope to draw income to support the museum from this 400,000+ person event at Sturgis, we felt it was important to be there and analyze the happening. But that meant the time needed on my dynamometer with my backup engine would not happen. So we pushed going to Bonneville Salt Flats to an event called World of Speed (WOS) sponsored by the Utah Salt Flat Racing Association ran mid September. The problem with running at WOS is it’s only a 3 1/2 day event (vs 6 1/2 days at Speed Week) and the weather is almost always a factor and causes cancellation about every other year of the entire event. After the Sturgis rally and the Saab Owner’s convention in LA, I was able to spend a couple weeks on my dyno with my back up engine and get it performing nicely. We were the current land speed record holder in our class of 501-750cc engines prior to going this year with a record of 123.075 mph. We did that in 2016 with an engine producing 104 hp in its most stable form. (Safe levels of compression & timing) Running on a Mustang Chassis dyno in 3rd gear at appx 100mph). After two weeks of testing and over 100 Dyno runs we were able to tweak the back up engine to produce 116 hp in a semi unstable condition. (Which means more compression then I should be running in Iowa!). With the extra gaining horse power we were fairly confident if we could get to the salt and not blow the engine we could set a new world record. 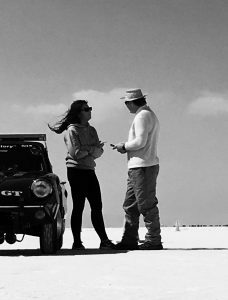 That said we set out for the salt on Wednesday, September 13 and drove 20 hours straight to get to Bonneville salt Flats. 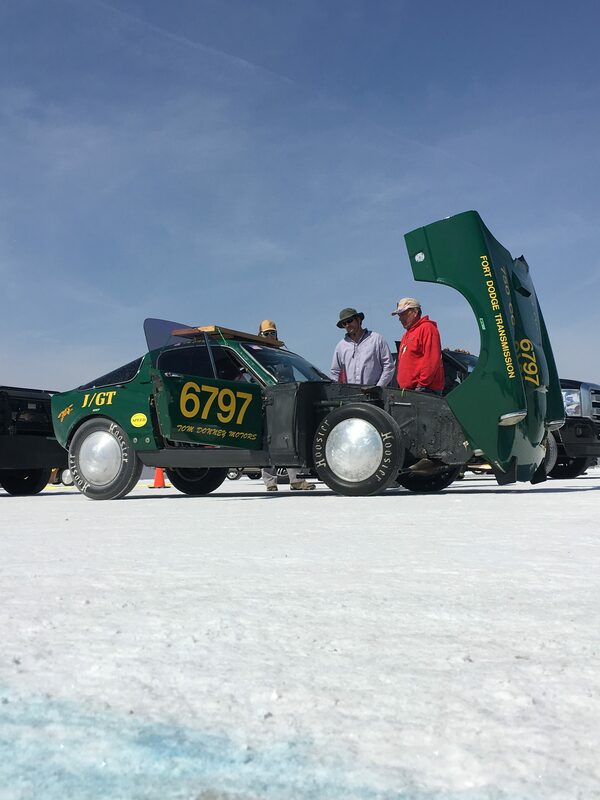 We put the car through technical inspection on Thursday afternoon and did not have any issues. We attempted to get fuel from the fuel truck which is the only place you can buy fuel in a land speed racing event like this. Both The fuel cell and your refill tank are required to be sealed under the eye of a race official. If the seal is broken or something looks strange your record will be disqualified. It turned out the fuel truck would not open till after racing started on Friday due to the inability to bring the fuel truck onto the salt by the fuel vendor. A snafu that I’ve not seen happen before. It turned out the fuel situation did not matter because when racing was to start on Friday morning the winds were too high and racing was delayed all day long. 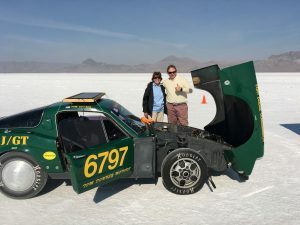 We had received our fueled by 11 AM and decided to take our car to the starting line, which is about a 45 minute trip. 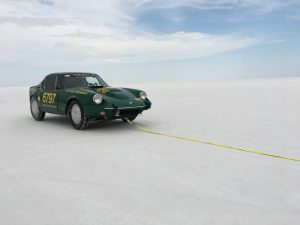 Distances at Bonneville are very hard to imagine but you can watch the curvature of the earth disappear over the salty Crust surface. A very unusual landscape indeed. 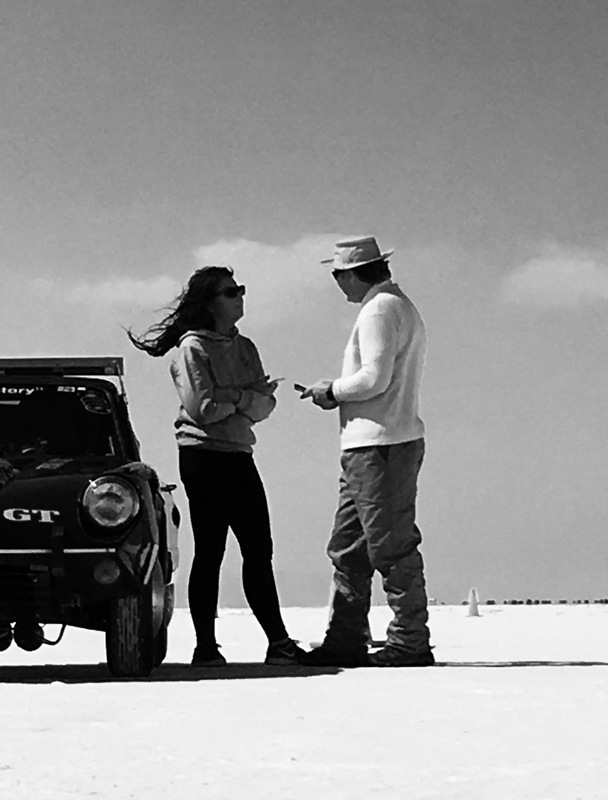 And your race car must be towed anywhere you take it, with a maximum speed is 15 to 20 mile an hour because of the bumpy salt surface. Our car sat in line all day Friday as we patiently waited to race. But it was to no avail as the winds got stronger all day long. 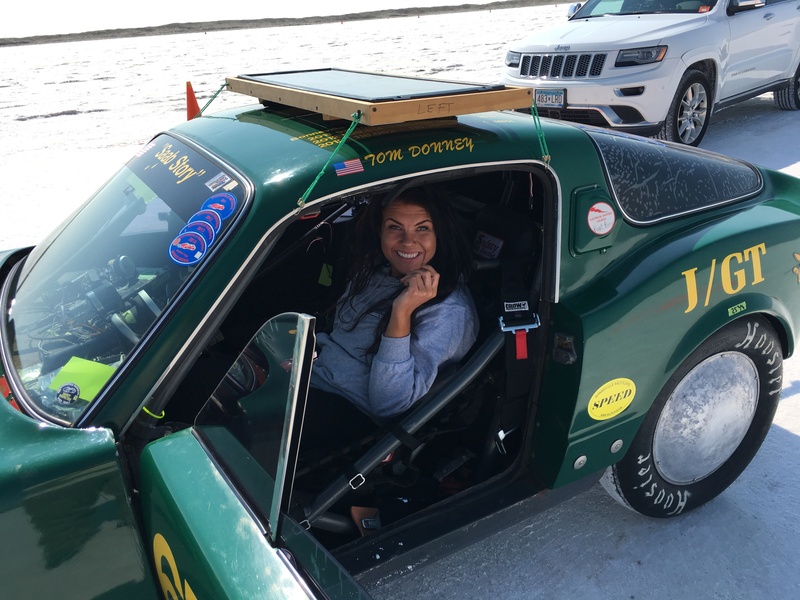 The races were officially canceled for the day about 5:30 PMand we made the decision to leave our car out on the salt overnight, thereby keeping our 6th place in line so we could start racing early Saturday morning. On Saturday morning we able to run by 9 AM and had a disappointing speed of only 119.6 mph averaged from the 2 to 3 mile start to finish. That was much slower than our 123.075 mph record and I was a bit puzzled what to do next. We made some quick jetting entire changes and were able to get our second run in by around 2 PM. That run produced and even slower speed of 118.6 mph much to my dismay. One thing not helping was the track was extremely hard and bumpy. The winds on Friday had dried it out but now everything was in bumps. Even though they plow the salt much like you would plow a street with snow, it was still very hard surface and bumpy and hard to control my car at speeds of over 115 mph. This is a new phenomenon and something I had only started to experience last year in 2016 as the salt conditions have steadily degenerated over the last several years. As many of you may know most events were canceled in 2014 and all events were canceled in 2015 due to thin salt and wet conditions. The salt used to be over 2 foot thick back in the 1950s but mining and other factors have caused the salt crust to diminish to an extremely unsafe level. And a byproduct of this is a very hard surface. Some say it is because a local mining company is now putting salt back on to the surface of the flats, but it seems to be much harder since it no longer has potash in it. (Potash is what they are mostly mining). Also the salt becomes airborne very easy were it used to be wet and sticky. There are many agencies studying this to see what exact exactly going on. Back to racing!! Saturday afternoon late we were able to get up into the first starting position but unfortunately the races were called just before it was our turn to run due to the low light of sunset. 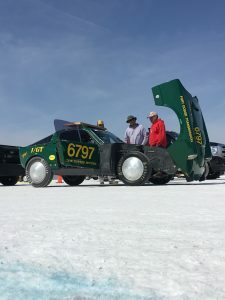 So once again since we were in the first position we decided to leave our car out on the salt overnight rather than securing it in the safety of our trailer back in the pit area several miles away. On Sunday morning we came out and made a few minor changes & tricks and found the magic formula to make the car run as it had back in Iowa on the dyno. 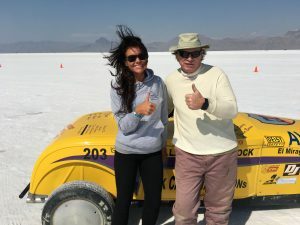 Our early morning run on Sunday produced what is called a “qualifying run” where we exceeded our own record of 123.075mph by a speed of 124.479mph. We actually hit 125mph on the GPS for about 6 seconds but the only speed that matters is the average speed from the 2 to 3 mile mark. In the land speed racing at Bonneville setting a world record is a two day event. It requires what is called a “down run” or a “qualifying run” where your speed must exceed the current record. Once you have done that your car goes to an area called “impound” where you have about four hours to work on it and then you must cover the car and leave it overnight. Then in the morning you come out early before daylight and get your car ready and as a group of qualifiers get escorted under the watchful eye of the officials to the starting line. This is what is called a “return run” or a “record run”. We took our car to impound and spent the necessary time (maximum of 4 hours allowed) to make adjustments and check the car over carefully for any possible issues. We were going to leave the area as required after 4 hours but we were informed that due to weather coming in on Monday morning they were going to be running our return runs (record runs) later that afternoon. Many of us racers in the impound wondered about this since the weather forecast looked good till about noon on Monday and typically your car does not run as well in the heat of the afternoon. That said at WOS heat is normally not an issue as the hottest day we had was 78° which occurred on Sunday afternoon for our record “return” run. Speed Week this temperature could easily have been 98° which is a factor. All that said we went ahead and made a return run in the car about 4:30pmand the Saab ran perfect up until about the 2 1/4 mile mark with a speed of 124mph. At that point it picked up a very slight engine miss and our speed instantly declined to 121 mph. Even though the miss was slight it was enough to cost HP and speed. But fortunately the miss went away at the 2 3/4 mark rather than becoming a complete engine failure! 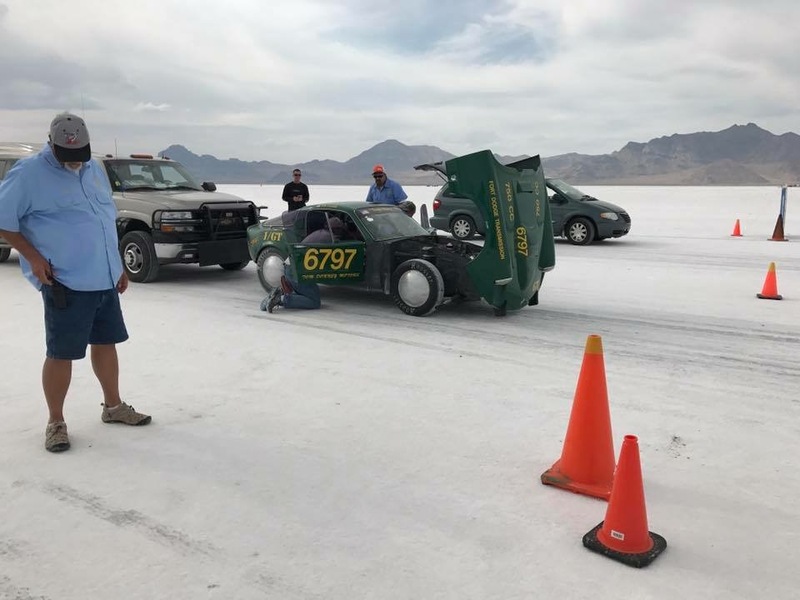 Then from the 2 3/4 mile mark to the finish line at 3 mile the car actually gained its power back and the speed increased to 123 mph in that last 1/4 mile. 123.052 mph was our official return run speed. This gave us a two-way average over the two days of 123.765 mph and a new world speed record for a J/GT class. That speed record is actually faster than the I class which is the 751-1000cc engine class above us! But since we set our record on the last full day of racing we only had half a day on Monday to try to once again establish a faster record. Knowing we would only have a couple runs on Monday we decided to go with a “break a record” or “break a part” approach. We swapped to a higher compression head and a higher octane fuel and simply ran out of time to make the combination work at a faster speed. We were able to squeeze in three runs Monday morning and our third run look to be the fastest running 123mph at the 2 mile mark until I ran out of fuel! I know that sounds ridiculous but we only had about a half hour of racing left and it would’ve taken us 45 minutes to an hour to refuel our tank since it must be done under the official sanctioning rules. We made a calculated guess we had enough fuel and were wrong. We had switched fuels that morning and the specific gravity of the new fuel was lower. Thereby causing fuel consumption to increase slightly and our small fuel-cell to run out after 2 & 2/3 runs! 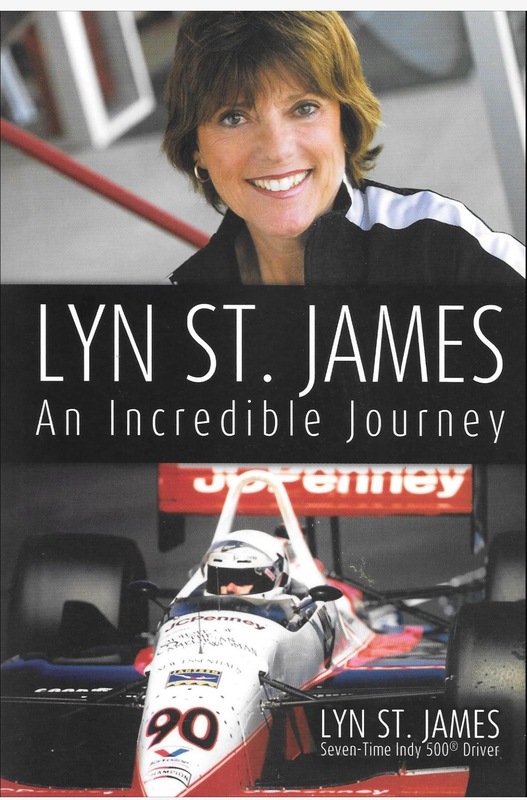 And as anyone knows that has raced, if you run out of fuel in a race you’re going to burn up an engine. So we succeeded in “breaking a part”. As a sidenote we dedicated our last run to a friend of mine and former employee, Brian Healy, who lost his life at a too early age to cancer. And just as Brian’s life had been cut short by cancer, so was our run cut short at the 2 mile mark due to running out of fuel. All in all we had a great time at the salt and I was finally able to take my long time friend Chuck Crimmins. 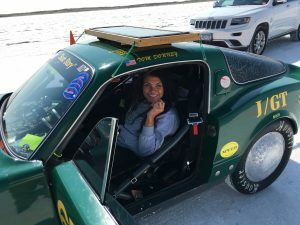 Chuck had made the 20 hour 1 way trip to Bonneville back in 2014 only to sit idly in the hotel for two days until rain finally squelched all hopes of running at Speed Week. When wind caused WOS to be canceled on our first day there on Friday had begin thinking Chuck was a bad luck charm! But his insight into engines and his lifetime of racing experience became invaluable to me at the salt Both Chuck and another fellow employee Will Roberts made the trip very enjoyable. Our goal this year was to set a record and try to have fun. We Succeeded at both in the cooler temperatures that WOS provided us. Also WOS allowed us to meet two very special ladies! Lyn St. James who was a 7 time Indy 500 driver who ready helped break barriers for women in Motor Sport Racing. Also Tracy Hoffman from Sweden who is a Swede really into US HOT RODS and Muscle cars!